Home » Uncategorized » Average American Income: Is it enough? Last week I wrote an article on the income gap in the U.S. The post was in response to the reported news of an increase to the median income in the US. 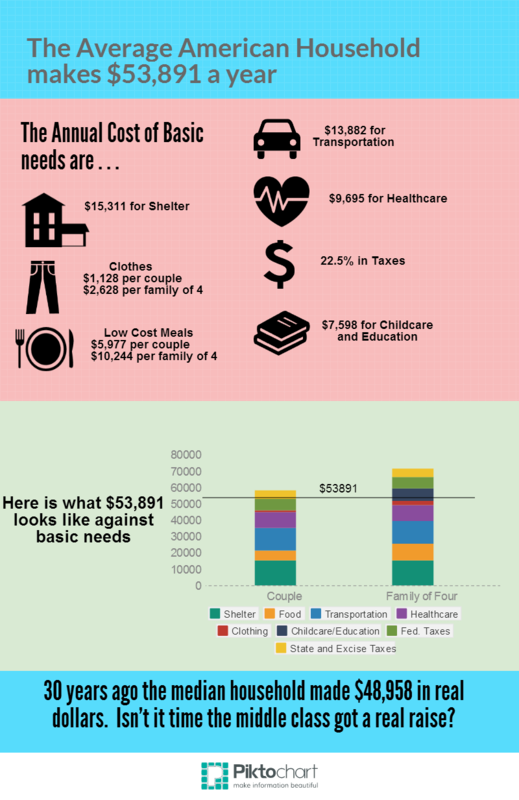 While researching I came across data on the cost of basic needs for average Americans from numerous government and private studies. Unfortunately, the numbers are downright scary. While I speak of “average American income” please note that I am using the median income for the data points. This will eliminate statistical outliers. For instance, households making 30 million a year have a profound impact on an average, where they count equal to all other households when using the median. The results of compiling the data are shown in the info-graphic below. The graph clearly shows it’s financially impossible for a middle class household to address the basic needs of a family of four. Furthermore, a middle class couple without children appear unable to support their own basic needs. It’s no wonder why consumer debt is so high, as they have no choice but to go into debt to maintain a basic standard of living. Shockingly, the total expenses of a family of four totals about $70,000. Even more distressing, a household income of $70,000 out paces the earnings of 65% of the households in the U.S. Therefore, an American household’s income needs to reach the top 35% of households to barely meet the basic living standard for a family of four. If a family wants to save for retirement, send kids to college, go on vacation, and possibly go to the movies every so often, they are going to need to earn more than 80% of the rest of America. Please don’t think this is meant as “class war rhetoric”, as I’ve shown last week that the top 1% isn’t to blame. Something needs to be done about the way income required to cover basic needs doesn’t seem to reach the vast majority of the country. Perhaps “trickle down” was an apt way to describe the economic policies favoring top earners, as a majority of American are just getting a “trickle” of income to get by. I think it’s important that this information gets out there so please use the social media buttons at the bottom of the post to share this around. I even have the info-graphic set up for Pinterest. I was very conservative when compiling this data so expenses may even be on the low end of the spectrum. All data are CPI adjusted to 2014 dollars. The income statistic taken from a Sentier Research report The food estimates were from the USDA Cost of Food Report where I was sure to use numbers between the low-cost and moderate plans. The shelter cost statistic comes from the Bureau of Labor and Statistics. It includes not only the cost of renting or buying, but what the average American needs to furnish and maintain the shelter. The transportation information comes from the low end estimate from the Center for Neighborhood Technology. Healthcare estimates are from the Milliman Medical Index. Clothing estimates were compiled from Statisticbrain. It includes the cost, cleaning, and maintenance of the clothing. Tax percentages are pulled from the income taxes actually collected. Taxes accounted for are Federal, State, excise, Social Security and Medicare, sales and property. Information was compiled from Tax Policy Center. Information on the childcare and education costs are from USDA.